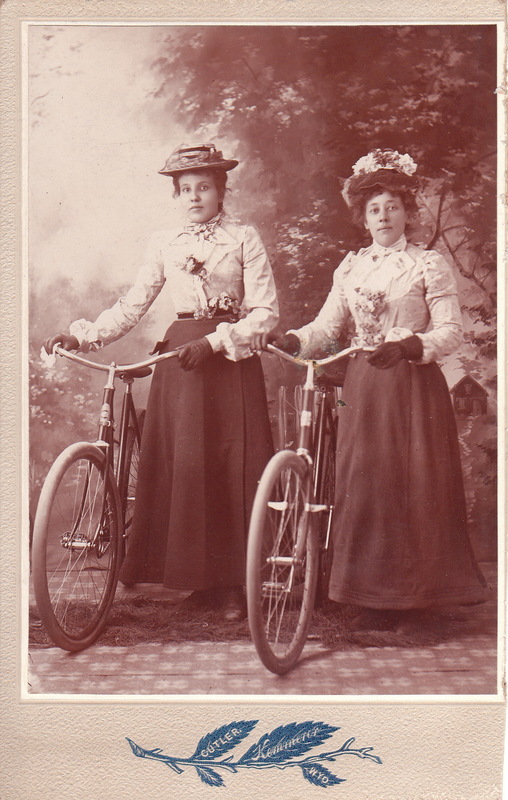 Two well dressed woman pose for their portrait alongside their bicycles at the Cutler studio in Kemmerer, Wyoming. They are similarly dressed and both are well adorned with flowers.Each are wearing gloves and pretty hats. Joseph H. Cutler emigrated to the United States from England in 1883. This photograph was taken well after that time. The town of Kemmerer became an independent entity in1897. It was founded by an officer of a nearby coal mine company. Interestingly, the retailer J. C. Penny was founded in Kemmerer in 1902. J. 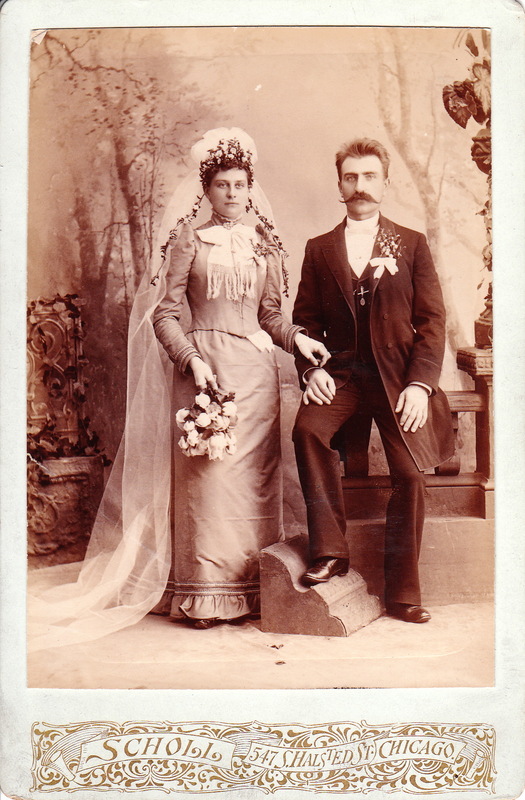 B. Scholl, well known Chicago photographer, produced this wedding portrait of a smartly dressed bride and groom. The groom has a nice handlebar mustache. The bride is wearing a pretty floral wedding veil and appears to be holding the grooms sleeve rather than his hand. Despite their lack of physical contact, the pair are standing much closer to each than seen in many other wedding photographs. I wonder why the photographer posed the gentleman with one foot elevated on a curb. At first, I speculated that the rationale was to add height to a groom who was shorter than his bride. However, the gentleman has both knees bent which certainly restricts his reaching full height. My final conclusion was that the photographer, normally quite skillful, had a bad day and was careless setting up this particular pose.To view more of Mr. Scholl’s photographs and to learn more about him, click on the category “Photographer: Scholl JB. 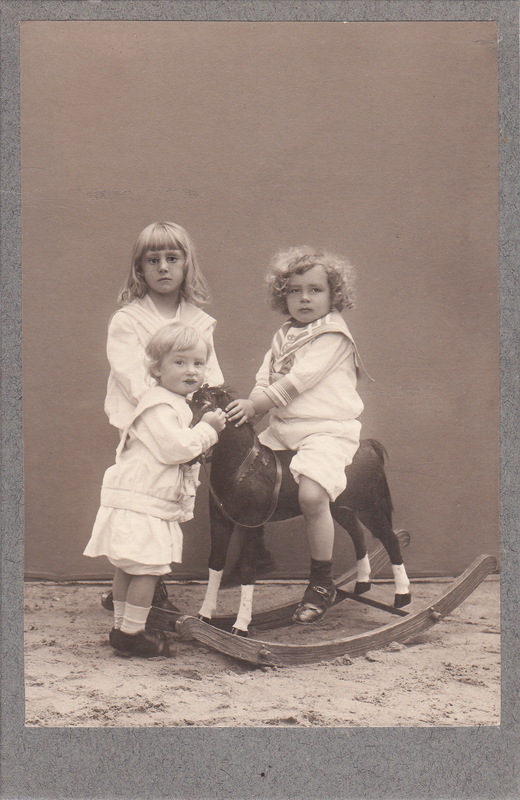 Sharing is never easy for siblings but these three children appear to be doing a pretty good job of avoiding combat over rights to the toy rocking horse. The children, dressed in white sailor type suits are quite adorable. None of the three kids look all too happy posing for photographer Louis Heuser. 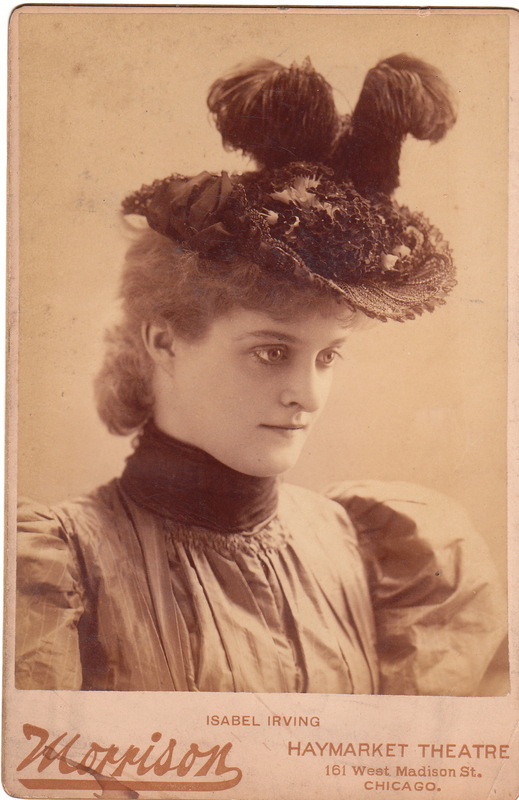 Heuser’s name is stamped on the reverse of the photograph but no address is given. Research was not productive in finding the location of Mr. Heuser’s studio. 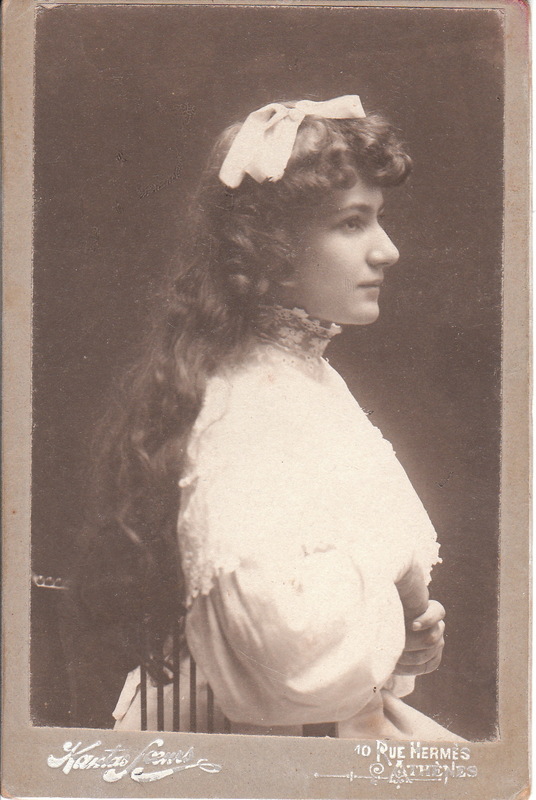 This photograph features a portrait of an extremely pretty young woman. Unlike many images of this era, the subject is smiling. She has a great smile. 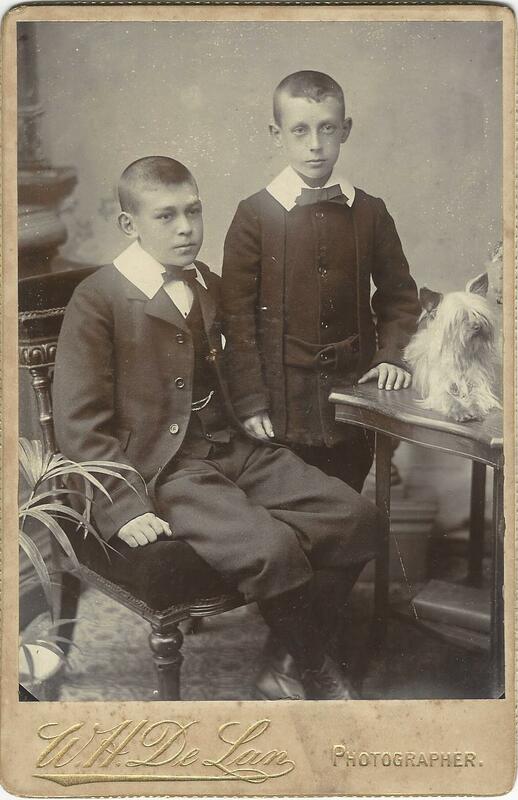 There is an inscription on the reverse of the photograph. Unfortunately, I can not translate the words. It’s all Greek to me. The photographer is Kantas Soeurs and his studio was located in Athens, Greece. 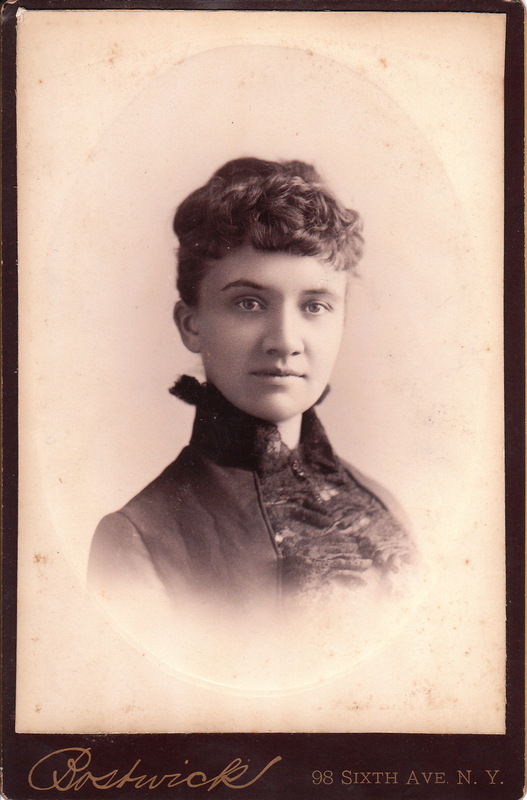 This photograph is either from the cabinet card era or slight after that period. It measures 4 3/4 ” x 3 1/8″. Addendum: A visitor to the cabinet card gallery kindly provided a translation to the inscription on the reverse of this image. The inscription reads “To my dearest Georgios as a very small token of my love. (signed) Zaharula” The translator added that the term “Kandas Soeurs” (seen on the front of the photo card) means “sisters” in French. It is posited that the photographer (Mr. Kandas) died and his sisters took over the studio. The vast unpaid research department of the cabinet card gallery never cease to amaze me. They are resourceful researchers and well informed in multiple interest areas. Thanks to all the visitors that contribute their time and knowledge to increase the quality of the site. 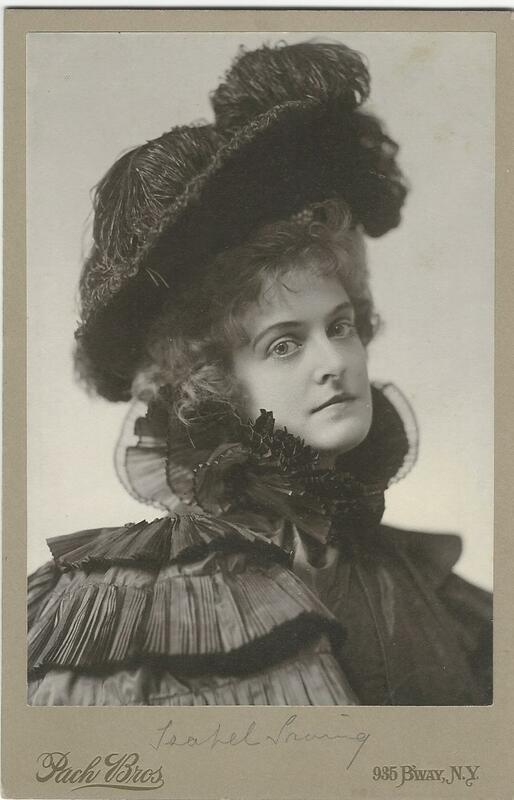 A pretty young lady poses for her portrait at New York City’s Bostwick studio. The woman has a wonderful smile accompanied by “smiling eyes”. It appears that this cabinet card once resided in an oval frame judging by the oval indentation on the image. 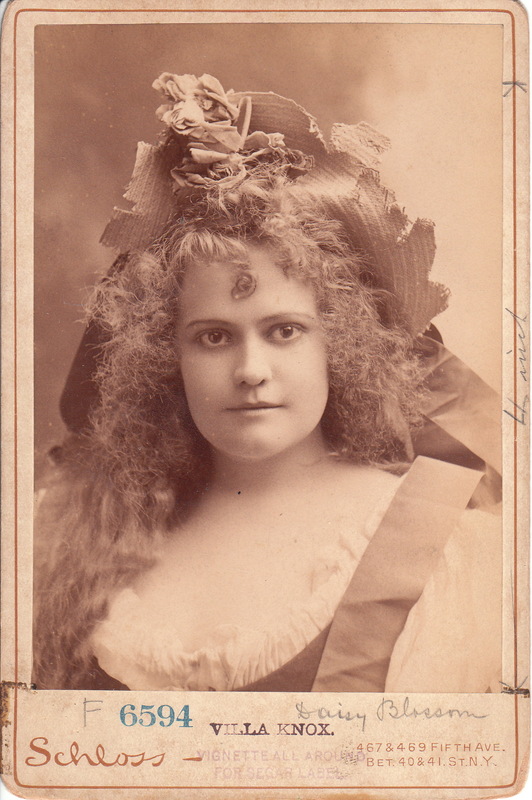 Advertising on the reverse of this cabinet card reveals that Bostwick’s studio was located between 8th and 9th Streets in New York City. The ad also notes that the studio was established in 1867. James Alba Bostwick was born in 1846 or 1848 in Livonia, New York. At one point in his photography career he was a partner in a firm named Bostwick and Bancker. A collection of Bostwick’s work is owned by the University of New Hampshire’s library. In 1927 Bostwick died in Brooklyn, New York. He was 79 years of age at the time of his death. 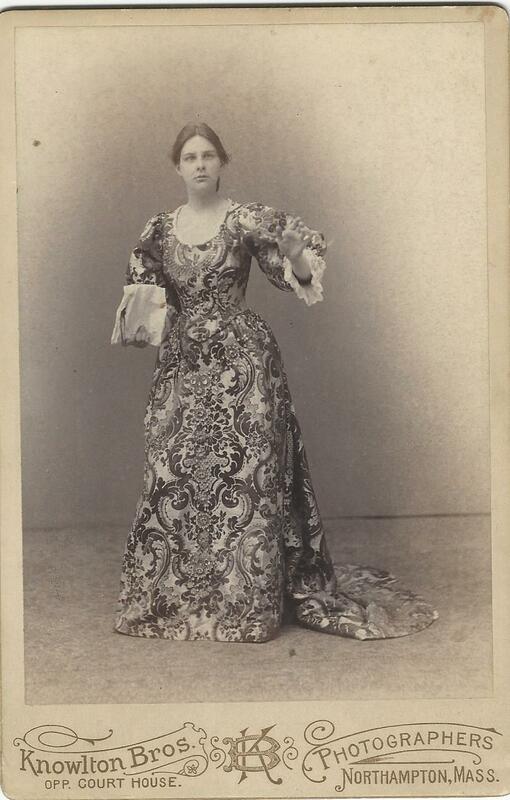 This interesting cabinet card features a woman wearing a very unusual dress. The dress’s pattern can be described as psychedelic. Some would call the pattern paisley. One wonders if the woman’s dress really looked this way or if an artist colored the photograph while knocking off a bottle of whiskey. Another theory is that the subject woke up the morning of her appointment at the photographer and realized she had nothing to wear. In an act of desperation, she wore the living room drapes. Before I conjecture further, I want to call for assistance from the cabinet card gallery’s research department. Perhaps one of the several fashion savvy cabinet card gallery visitors can share their informed opinion about this woman’s attire. I shouldn’t call her “this woman” because I know her name. 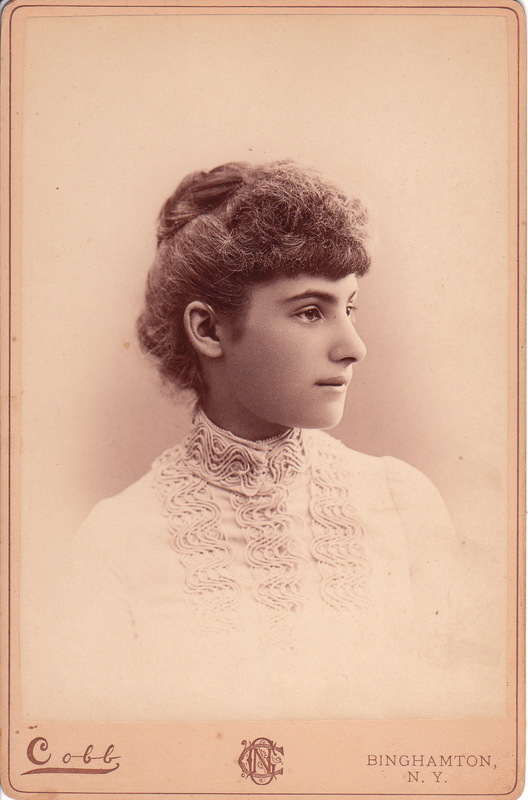 An inscription on the reverse of the photograph reveals that her name is Sarah Goodwin and that the cabinet card photo was taken in 1892. The 1880 US census finds a Sarah Goodwin living in Ware, Massachusetts. This is a town 24 miles away from Knowlton Brothers studio in Northampton. 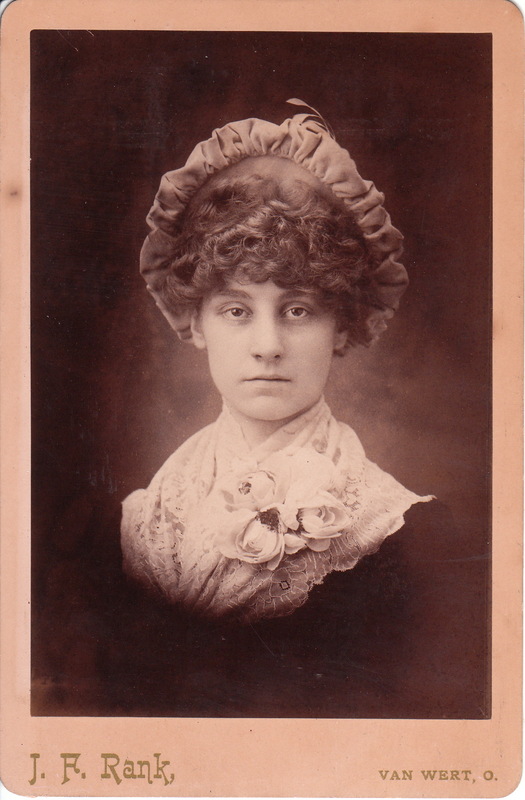 At the time of this photograph, Miss Goodwin was twenty nine years-old and working in a cotton mill. She was the third of five children born to Steven and Mary Goodwin. 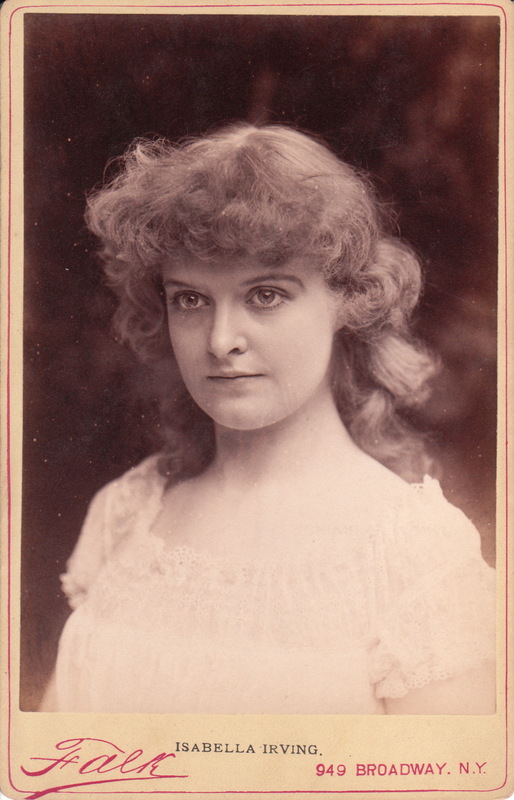 Sarah was born in 1863 in England, which was also the birthplace of her parents.